"On October 23, 1864, Confederate General Shelby being forced back from Westport by General Curtis and flanked on the east by General Pleasonton formed a defensive line here behind stone fences running east and west to the State Line. Jackman's Brigade of Shelby's Division arrived after 1:00 P.M. To defend the Confederate right flank. Shelby's 'Iron Brigade' under General Thompson was farther west. Generals Curtis and Pleasonton finally drove the Confederates south. Go southeast to the Confederate Monument. 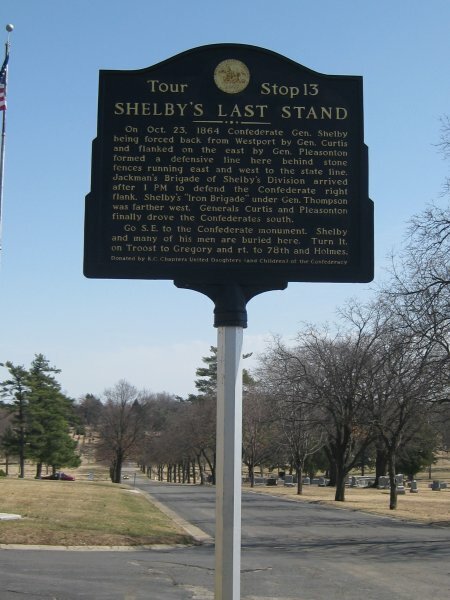 Shelby and many of his men are buried here." Directions to Stop #13: Take the east exit out of the parking lot near Tour Stop 12 and turn right onto Meyer Boulevard. You will initially be heading south but the road quickly will turn west. If you take the north exit out of the parking lot, turn right (east) onto 63rd Street and take the next right (south) onto The Paseo. Stay to the right and get onto Meyer Boulevard. The first traffic light you come to will be Troost Avenue. 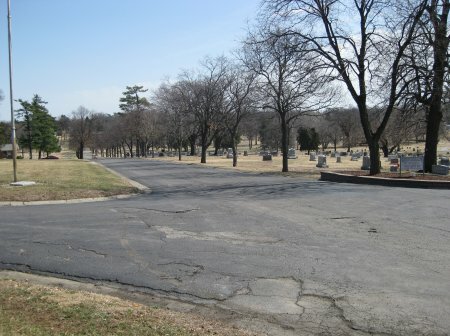 Turn left (south) onto Troost and drive for about 0.6 miles and turn into Forest Hills Cemetery (6901 Troost Entrance). The marker is on your left just after entering the cemetery. This tour stop is located in Kansas City, Missouri 64131. Description: In the early morning hours, Price had hatched a plan to have Marmaduke's Division hold Pleasonton at the Big Blue River while Shelby's and Fagan's Divisions defeated Curtis' Army of the Border. Then Shelby and Fagan would turn to support Marmaduke and destroy Pleasonton's Division. Neither tactic had worked and Price's army was now in danger of being destroyed. It was 1:00 P.M. when Union Colonel Jennison's First Brigade had routed the Confederate Iron Brigade commanded by Brigadier General M. Jeff Thompson. Thompson desperately tried to regroup his men as they galloped south. About two miles south they came to a log line of stone walls running from the east to the west. Here Thompson was able to rally his cavalrymen to make a stand. This line of stone walls extended eastward from the point near where you are standing. Here the remnants of Shelby's Division fought gallantly against the combined forces of Curtis' Army of the Border and Pleasonton's Cavalry Division. Shelby was able to buy time so that Marmaduke and Fagan to safely withdraw from the battle and for Price's wagon train and cattle herd to get further south. Once Shelby was certain that the rest of Price's Army had escaped, he himself withdrew to the south. 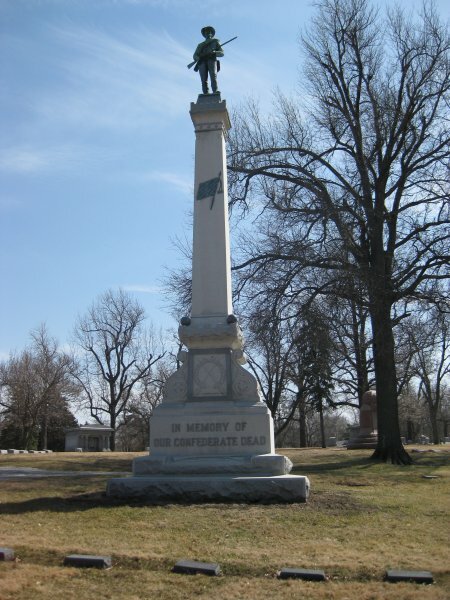 Directions: Drive southeast from the marker at Tour Stop 13 until you see a tall narrow monument. 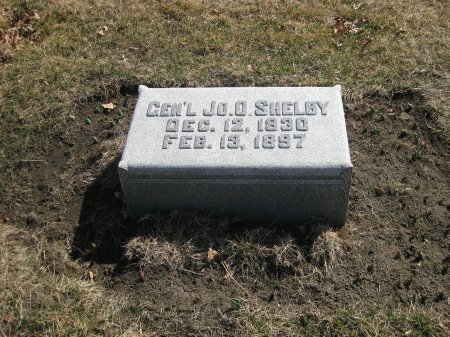 In front of the monument is the grave marker of Jo Shelby.